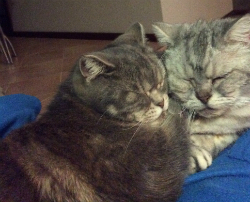 For several years now my two British Shorthair sisters have enjoyed their daily treat of ‘Purrfect Bites’ for cats. Prior to becoming aware of Petfare & its products, I was never completely happy with the various commercial biscuits on offer, many of which were very costly & which caused adverse reactions. After a whinge at work one day a colleague suggested I try Petfare. A trial pack was sent & immediately enjoyed by the girls. They’ve been fans ever since & they’ve not looked back. The product is outstanding in every way. Equally outstanding is the service provided by the owners, John & Trish. Clients receive a regular email notification to see if an order is required. Once confirmed, said order is personally delivered on the day advised. Too easy! We need to get behind this WA company, their products are 100% Australian Made, there are no artificial colours & flavours, their prices are ridiculously competitive & most importantly, our furry friends remain happy & healthy. I highly recommend giving them a go. I'm a strapping young Dobermann and my mum and dad have been feeding me Pet Fare for dinner for the past 3 years. I've gotta say that I really enjoy it and don't even bark at the delivery man anymore (even though I'm supposed to growl at everyone who visits us). It keeps me trim, taunt and terrific and I'm a thoroughly satisfied customer. We won't need your product anymore, unfortunately. 'Sam' has gone to 'Dog Heaven'. We have had to put him down due to old age. He was a Golden Retriever 16 years 9 months. Normal life span - 12-14 years. Says a lot for 'Pet Fare' as he has lived on that all his life. I am sorry to have to write to cancel my order for the dog meat. Toby, my dog, is having many problems with his knee reconstruction and arthritis, and the vet has recommended that we swap to another product with supplements. I'm going to give it a try, and will cancel my order for now, but if there's no improvement, we will be right back. Toby has always enjoyed the food - quite a change for a very fussy dog. It's been fantastic that he's wanted to eat it for so long - unheard of with any other food. Your service has been impeccable and I've recommended Pet Fare to many people - and will continue to do so. Many, many thanks, once again, for a great product and fantastic service. It's been a pleasure. Since returning to Western Australia in 1987, and owning Great Danes for the past 30 years, we highly recommend Pet Fare buckets of pet food as a well balanced and nutrient product for any pet. All our Danes, since 1988, have thrived on this from puppy to adult, and like the Great Dane, we believe it to be great, we have found no other product in comparison. I can't quite believe it myself but our 2 dogs have been enjoying Pet Fare meals since November 1997 and they have never got sick of it. That's 7 years! It gets delivered to our front door every week and with an Alaskan Malamute and a Red Cloud Kelpie you can imagine we go through a fair bit of food between them so not having to lug it home from the supermarket each week is a godsend. Pet Fare is so easy to use. You just slice it up and serve it straight from the tub and unlike some others it doesn't have that real dog food smell. The dogs love it and the tubs get recycled so the environment loves it too. Our dogs are now both 13 years old and even our local vet believes they are as healthy as they could be. Pet Fare food gives them all the vitamins, minerals and cereals they need in their diet. All we have to do is give them love and attention! We brought our Golden Retriever pup home in 1996. Our main problem was her fussy eating. She would turn her nose up at both store bought and home cooked food. A few weeks later Pet Fare was conducting a "free sample" promotion in our street. I told the rep if our dog would eat this food he would have a very thankful customer. During the 8 1/2 years since that day we have enjoyed fantastic and reliable service. 80% of Chloe's food intake is Pet Fare and she remains very healthy and contented. We would recommend Pet Fare to any and all dog owners, and would be happy to comment further if you wish to contact us. I have been feeding my dogs and cats Pet Fare for nearly 20 years, almost as long as the company has been in production. In our day and age it is nice to feed our pets a totally natural product and in my opinion they need wet food as well as dry. Pet Fare is a well balanced diet of chicken, lamb and cereal, precisely measured in a correct ratio, gently simmered and potted into convenient 5kg buckets. The buckets are returnable environmently friendly and the premises are kept spotlessly clean. Pet Fare does not give our pets smelly breaths, their motions are firm and is very suitable for over-active pets or any with skin allergies. I have been breeding and showing Old English Sheepdogs for 30 years, weaned many litters on Pet Fare and can thoroughly recommend the product in every way. Our two 4-year-old miniature schnauzers have been fed on Pet Fare since puppyhood. They love it and it must be good for them as they are two very healthy dogs. A big plus for us is that the food is solid and chunky when cut up, so they don't end up with messy beards and moustaches! Also they must have very healthy digestive systems as they are easy to clean up after, at home or during walks. It's also great being able to recycle the buckets. I have been receiving dog food from you for my dog Shah, a Golden Retriever, for over a year now. I am very satisfied with the quality of the product, Shah enjoys it and it does not upset his stomach like some dog food does. Also the fact that it is delivered weekly to my house saves me having to bring home large quantities of dog food from the supermarket, and the price is reasonable. I have always found the staff to be both helpful and friendly and Shah always enjoys greeting the Pet Fare man when he delivers the food. Keep up the good work. This note confirms that we have been giving Bobby (our 12 month old dog) Petfare potted meat and biscuits for the past two months. We are so pleased with the product both in the value for money and the obvious nutritional value that we thought we would tell you. Bobby's bowel movements since we switched him on to Petfare have been continuously firm and regular, prior to this we were buying him proprietary brands of various supermarket products in an attempt to find a good staple diet in order to make him regular without to much success. Bobby looks forward to his meals and just loves the biscuits, he is thriving on his new diet and therefore our thanks for the trial pack supplied at dog training that Sunday morning a couple of months back. Your home delivery, friendly service and superior product make it a no brainer to buy from you. By the way Bobby thanks you too.